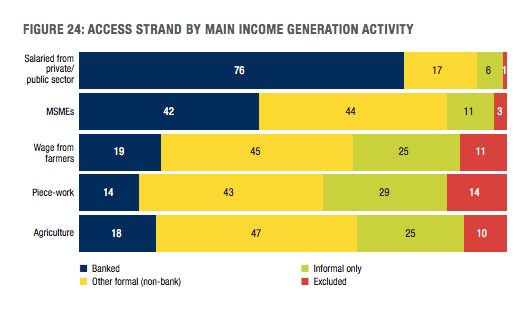 AFR explores FinScope's 2016 survey in their latest report on financial inclusion in Rwanda. AFR revisits financial inclusion in Rwanda in 2016 vs. 2012, showing that rural inclusion is growing faster than urban inclusion, suggesting that a portion of the gap is narrowing. This is encouraging news for a country with 72% rural population and may complement the overall growth of the agricultural sector where grain production has increased more than 3 times since 2000. This insight on rural inclusion is just one data point emerging from the 2016 FinScope Survey, which is summarized in a recently released report published by AFR. The report provides an overview of the most recent data available on financial inclusion in Rwanda. It provides data illustrating the state of play on topics that include: mobile money, landscape of financial access, excluded populations, and money management. The report looks to describe the determinants, dimensions of financial inclusion, and provide a contextual review of country- and cross-country levels.